House rats are small animals with strong bodies, short limbs and long tails. Unlike most of the pests we deal with, Rat and mice are mammals and they have the most abundant population of any mammal. NRats have become the an extremely dangerous pest. House rats populations grow very quickly, so it is best to target them early before the population grows. There are quite a few preventative measure you can take that we will discuss with you during an inspection. If you are in need of rat control services, our team will aggressively and effectively treat the infestation with the least impact on the environment. 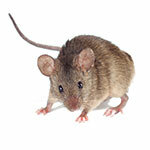 Pest-Pro Specialists can come periodically to monitor your home and help prevent an infestation of ROOF RATS.